Former President Jimmy Carter waves during a ribbon cutting ceremony for a solar panel project on farmland he owns in their hometown of Plains, Ga., Wednesday, Feb. 8, 2017. President Jimmy Carter is 94 on Monday. 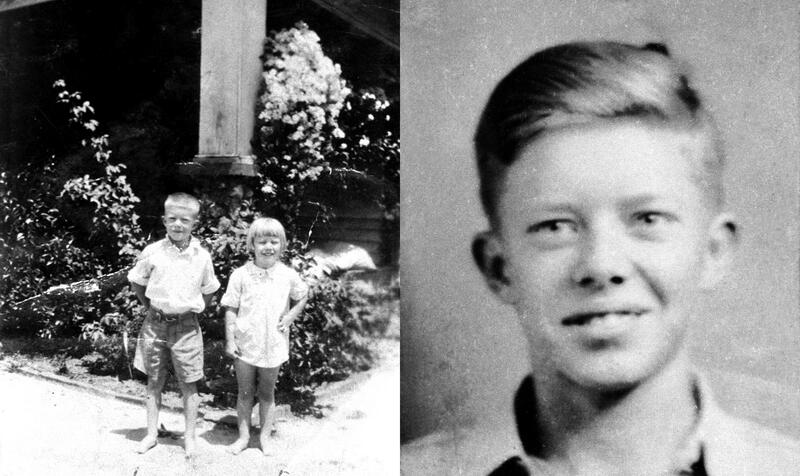 To commemorate his birthday, enjoy these photos that chronicle just a little of the life that took Carter from his hometown of Plains to his role on the world stage and, of course, back home again. Carter, left, with his sister Gloria, left, in Plains. Carter in a portrait, right. 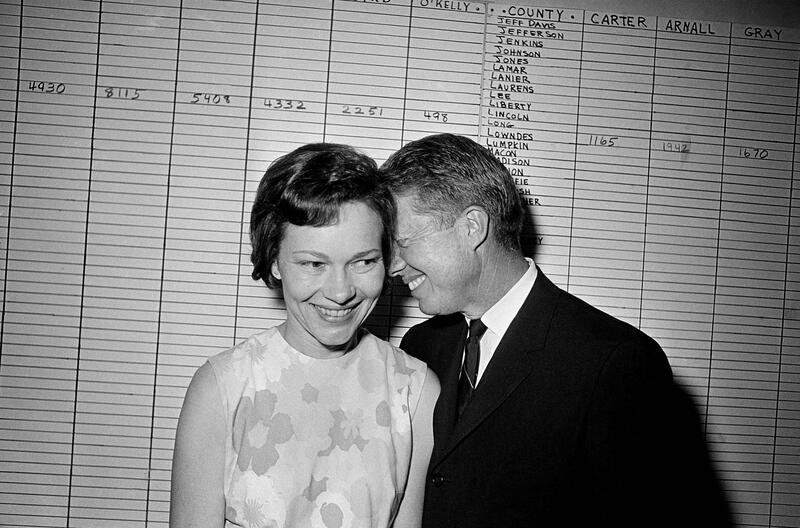 Then Georgia State Sen. Jimmy Carter hugged his wife, Rosalynn, at his Atlanta campaign headquarters on September 15, 1966 after making a strong showing in Wednesday's primary election, September 14, 1966, in the race for the Democratic nomination for governor of Georgia. Gov. 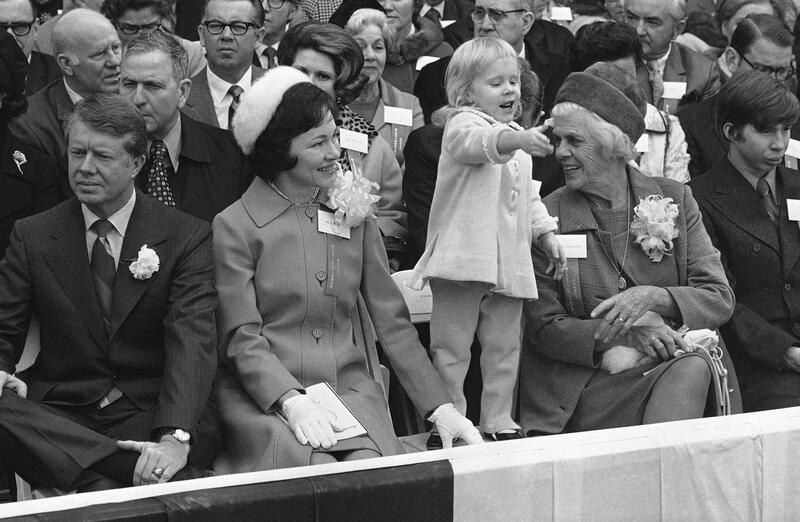 Jimmy Carter, left, Rosalynn Carter, daughter Amy Carter and mother Lillian Carter, right, listen while Lt. Gov. Lester Maddox makes his acceptance speech, Jan. 12, 1971, in Atlanta. Carter had just been sworn in as Governor of Georgia. 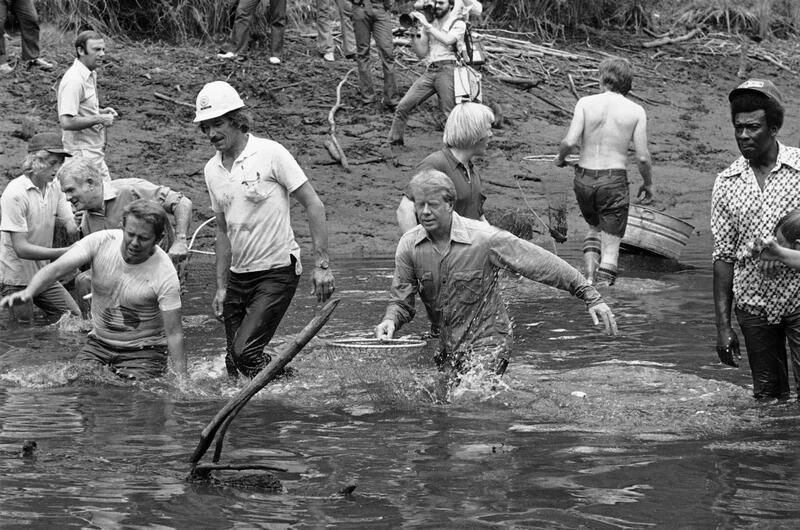 Democratic front runner for the presidential nomination Jimmy Carter, center, shown in the water as the Carter family and neighbors drained a pond and caught the fish with nets for a town fish fry, Friday, June 25, 1976, Plains, Ga. Billy Carter, at left with hand in water. 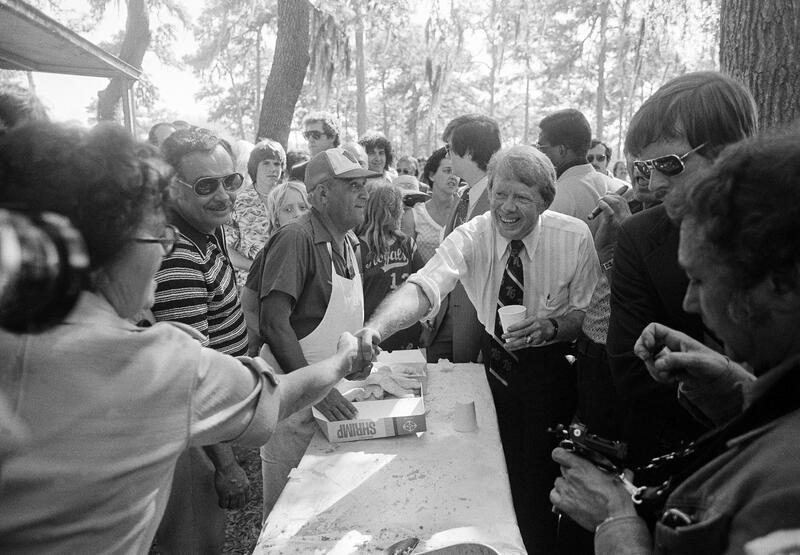 Jimmy Carter, right, Democratic presidential candidate, shakes hands and thanks the cooks at a fish fry and Carter rally in Tampa, Fla., March 7, 1976. 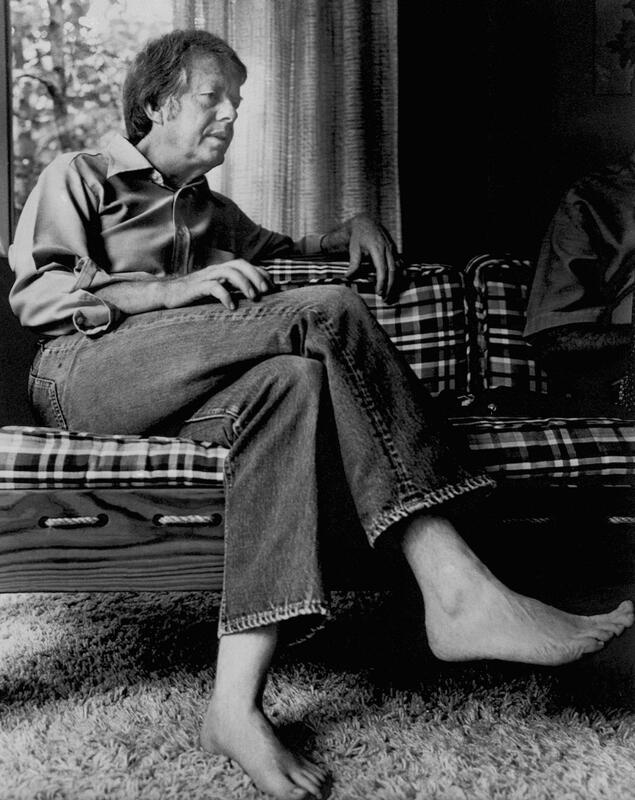 Former Georgia Governor Jimmy Carter, wearing jeans and barefooted, talks with newsmen in his home in Plains, Ga., Aug. 1975. 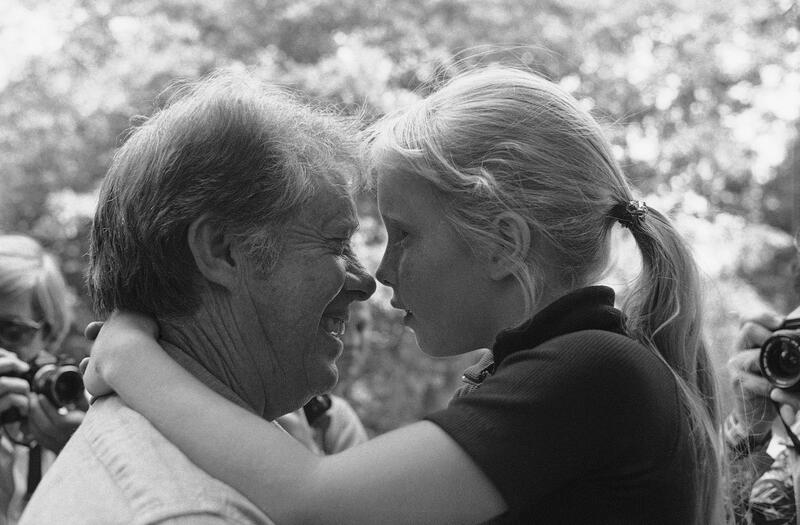 Democratic Presidential front runner Jimmy Carter and his 8 year old daughter Amy Carter have a moment alone, though they are in the midst of about 30 visitors to Amy's drink stand outside the Carter home, June 12, 1976 in Plains. 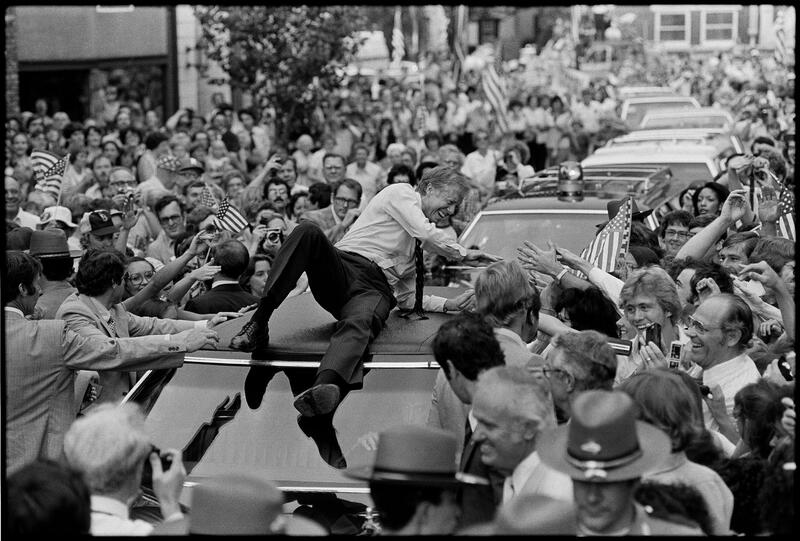 President Jimmy Carter leans across the roof of his car to shake hands along the parade route through Bardstown, Ky., Tuesday afternoon, July 31, 1979. The president climbed on top of the car as the parade moved toward a town hall meeting. 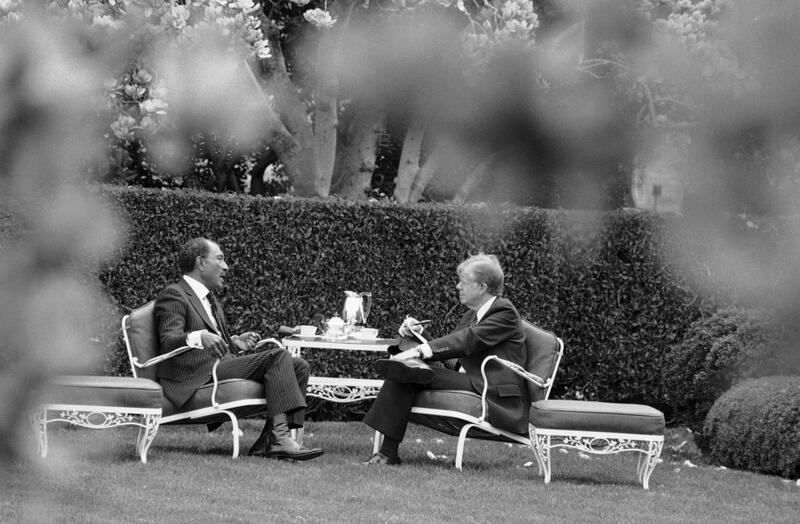 Egyptian President Anwar Sadat, left, and President Jimmy Carter together in Washington DC. Carter was instrumental in bringing Sadat together with Israel's Menachem Begin in the Camp David Accords which formally established peace between Egypt and Israel. 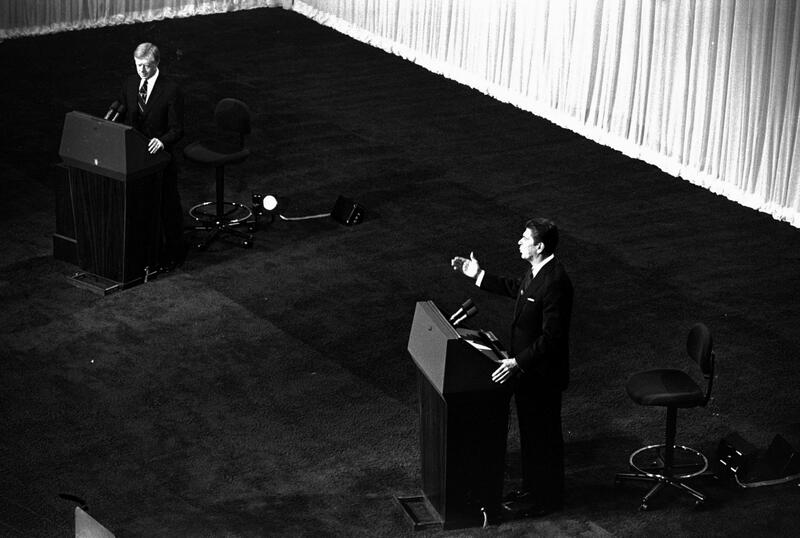 Republican presidential candidate Ronald Reagan, right, gestures as President Jimmy Carter listens during their debate, October 28, 1980, in Cleveland, Ohio. Former U.S. President Jimmy Carter visiting voting station as an elections observer in Monrovia, Liberia on Tuesday, Oct. 11, 2005.Voters cast ballots Tuesday for Liberia's first elected president since the end of a 14-year civil war that destroyed the west African nation, killed tens of thousands of people and left the living mired in abject poverty. FILE - In this May 14, 2002 file photo, former U.S. President Jimmy Carter, right, accompanied by Cuban leader Fidel Castro, warms up before throwing the first pitch in an all-star baseball game at the Latin American Stadium in Havana, Cuba. Castro has died at age 90. President Raul Castro said on state television that his older brother died late Friday, Nov. 25, 2016. Former President Jimmy Carter congratulates one of the nearly 40 people sworn in as citizens at the Carter's old high school, now the Jimmy Carter National Historic Site in Plains, Thursday morning, January 2013. 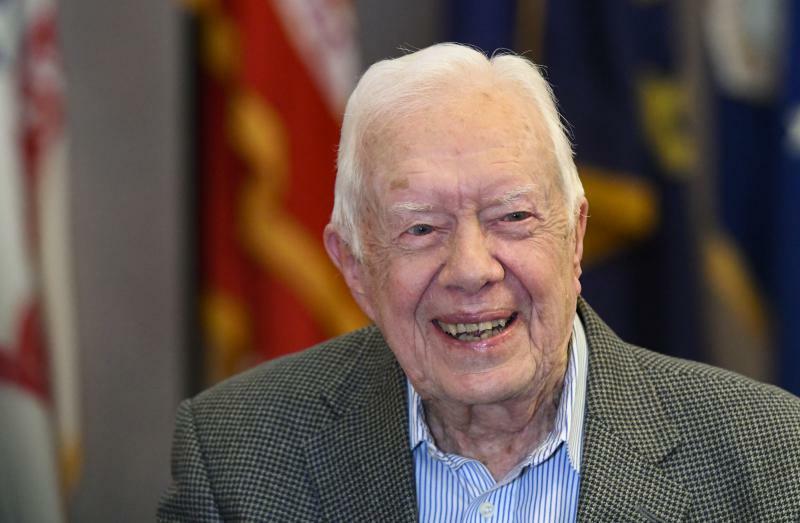 On this edition of Political Rewind, it comes as no surprise that former President Jimmy Carter has now endorsed Democrat Stacey Abrams for Governor. A while back, Jimmy Carter needed a doctor. Not just for himself, but for everyone in his hometown of Plains, Georgia. The town’s single doctor had folded up shop a while back. 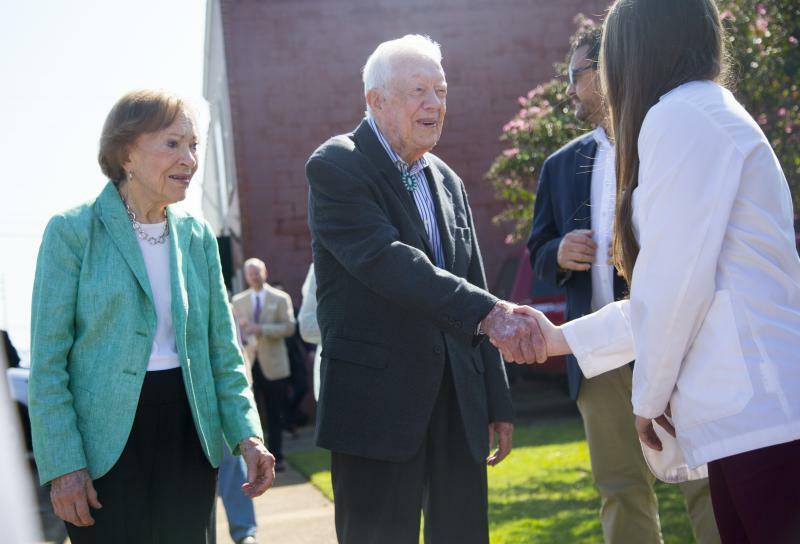 Luckily for Carter, he served on the board of Mercer University, which has a medical school. Turns out, all Carter had to do to get another doctor was ask. The upshot is that his asking may lead to big things for rural healthcare around the state.